Abram kept his promise, and Sarai kept hers they were wed, and so joined the royal house of Ur with the high priesthood of the Hebrews. So began a lifetime of great joy together, and greater peril: and with the blessing of their God, a great nation would be built around the core of their love. 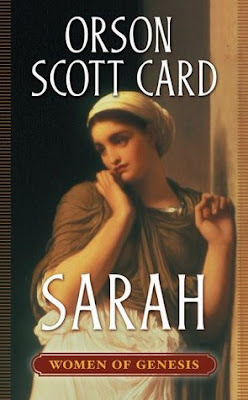 Bestselling author Orson Scott Card uses his fertile imagination, and uncanny insight into human nature, to tell the story of a unique woman--one who is beautiful, tough, smart, and resourceful in an era when women had little power, and are scarce in the historical record. Sarah, child of the desert, wife of Abraham, takes on vivid reality as a woman desirable to kings, a devoted wife, and a faithful follower of the God of Abraham, chosen to experience an incomparable miracle. Namely the purpose of her having a child with Abraham, how it served the God of Abraham and the Gospel as it is today. Libby very thoughtfully predicted that it was because things that had to come to pass, which will not come to pass until the Second Coming, in that region of the world could only happen through the lineage of Ishmael. (I hope I got that right Libby sorry if I misquoted you) Everyone present at book club who read the book or is familiar with the story of Hagar and Sarah absolutely hated Hagar, but understood that her behavior was the result of a human being who had been mistreated most of her life; she was simply a survivor. Many were mentioned but the two most easily recognized were the concept of a 10% tithe and the event of Abraham welcoming Sarah into his tent and giving her, her new name. The most heated part of this discussion was the answer to the question everyone had been asking themselves as they read..."Was Quira really that stupid? Did she really not know what was going on?" The answers were many and varied but the bottom line was, everyone was glad that she went back for her treasures!!! Everyone saw her differently, Sandra wanted her to be stronger and stand up for herself (and most of us agreed with that) but she also admired her ability to speak calmly and maintain dignity during difficult situations. Most of us saw in her the qualities we were missing and hoped to be able to develop at least a few of them over a life time; such as the virtue of patience- Sarah was very good at waiting for things to happen the way God promised they would. However, I think it's safe to say that we all walked away from this book very grateful to have been born in the 20th century when women were considered equal to men and were allowed to not only have an opinion but speak it at will!! Everyone loved the book and some of us have even read on in the series and recommend that anyone who reads and loves Sarah should definitely read Rebekah, Rachel and Leah, and The Wives of Israel! Book club was incredibly GREAT this month, the food was incredible, the company was remarkable, the discussion lively and well led, and the gift exchange was a HOOT!! I was lucky enough to get the fabulous Barefoot Contessa Cook Book Libby brought and though I lost out on the pedicure and the lip gloss (:p) I still felt extremely blessed to have such a great group of ladies to go "klubbin" with each month!! I LOVE BOOK CLUB! !